Sister Justine Cyr, C.B.S., past superior general of the Congregation of the Sisters of Bon Secours and past provincial of the order in the United States, died Jan. 1 in Marriottsville, Md. She was 82. Sister Justine was born in North Andover, Mass., in 1933 and joined the Sisters of Bon Secours in July 1952, taking her final profession on Sept. 8, 1960. She received her nursing degree from the Bon Secours School of Nursing in 1957 and continued her nursing education by obtaining a Bachelor of Science in nursing from Catholic University in 1966. For many years, Sister Justine worked in Bon Secours hospitals as a pediatric nurse, director of nursing, associate hospital administrator and hospital administrator in Darby, Delaware County; Baltimore; and cities in three other states. As health care began changing across the country in the late 1970s Sister Justine saw the need for hospitals to work together in formal health care coalitions. Her leadership was the impetus for the formation of the national Bon Secours Health System in 1983. From 1973 to 1977, she served as Bon Secours Health Care Facilities coordinator, the precursor to Bon Secours Health System. She also served as chairperson of the Bon Secours Health System board. “Sister Justine was an amazing woman and leader. Her vision and attention to detail provided a strong foundation for the successes of Bon Secours Health System,” said Richard Statuto, president and CEO of Bon Secours Health System. 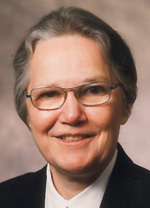 Sister Justine held many positions of leadership in the congregation, and in 1979, she became Provincial of the Sisters of Bon Secours, USA, a position she held until 1988. “Sister Justine’s gifts for leadership were extensive and served the congregation and the church in so many ways over the years. This same gift was evident during her retirement days on Marian Hall where she led by her example of patience and prayerfulness. Her personal health challenges in recent months prompted her to lead in new ways, in ways that reflected her deep spiritual strength and courage. Her life and example will continue to inspire many,” said Sister Rose Marie Jasinski, C.B.S., leader of Sisters of Bon Secours, USA. From 1989 until 1999, Sister Justine served the congregation of the Sisters of Bon Secours internationally as superior general, a position she held for two terms, five years of which were in Rome and five in Paris after the congregation moved its headquarters there. One of her major accomplishments was the restoration of the chapel in the Sisters of Bon Secours’ Motherhouse in Paris. “We have been graced with Justine’s presence and leadership in Bon Secours since she joined us in July 1952. There is not a part of us that she has not influenced. She has been a leader in the USA and internationally in health care as well as religious life. For us, she is the epitome of the valiant woman in Proverbs: a virtuous woman, a wisdom figure, a woman of strength. We will miss her greatly; she has been a model for us in every part of her life. We know her legacy will continue to be a part of us,” said Sister Patricia A. Eck, C.B.S., congregation leader of the Congregation of the Sisters of Bon Secours. After Sister Justine returned from Paris, she enjoyed a sabbatical during which she earned a master’s degree in spiritual and pastoral services from Loyola University, Maryland. She then became a member of the Spiritual Retreat Team at the Retreat and Conference Center of Bon Secours. She also served in a variety of ministries in Catholic health care over the years before retiring to Marian Hall in Marriottsville in 2009. The funeral Mass was celebrated Wednesday, Jan. 6 in the chapel of the Retreat and Conference Center of Bon Secours in Marriottsville. Sister Justine is predeceased by her brothers William (Buddy) Cyr and John Cyr. She is survived by a sister, Judy Morrison, and many nieces and nephews.